Two years ago I spent a week with my very successful relative in Sweden. Being with her day and night gave me the opportunity to see firsthand how she manages a multi-million business. All you need to do is keenly study those who have succeeded. -But studying them is not enough, you then need to take action. Even the Bible says in the book of James, “faith without action is dead.” God expects you to do something with your faith. In this article, I want to talk about ten things successful people do that you can copy. Successful people are obsessed with reading. Robin Sharma, the author of the ‘Monk Who Sold His Ferrari‘, says, “when you drive or jog, listen to an audiotape, so your mind is engaged in learning. Give yourself a goal to read a book every month that will help you improve your business. Jeff Bezos had a vision for Amazon. Few believed in his concept, -but he never gave up. Successful people tend to do things differently from everyone else. Their vision is crazy big, and many times others think they are insane. In five years from now, what do you want to accomplish? They are ready to do whatever it takes to succeed. They have a lot of self-belief and confidence. They don’t care if people don’t believe in their dream. They know exactly where they are going. Successful people understand that to succeed you cannot go it alone. On your journey, you need to help others along the road. Imagine you were on a bus and traveling 30 miles to get to your destination. Suddenly there was an engine malfunction, and the passengers had to walk the rest of the journey. There was no other bus coming that day. Some passengers would share water with those who got thirsty if they had extra water. Others may offer to help carry heavy luggage for a while, to lighten the load. On this journey, everyone would help one another so that they all arrive safely. This is how successful people think. They know the value of generosity and helping others. They do not have a lack mindset -but an abundance mindset. Successful people master their craft. They spend lots of time learning and improving their skill. They are consistent and stay focused. They do not allow distractions to take over. Neither do they try to be a jack of all trades? If you are a writer, master your craft. Study and practice. Aim at being the best you can be. They wake up early, and begin their day with meditation or have a set time to pray. Successful people own a journal. It may be a daily journal or gratitude journal. They know they need the energy to function at a high level. They understand that stress and exhaustion do not add value to their lives. Branden Buchard says we should manage our sleep, nutrition, and exercise to have peak performance. In spite of what the surroundings dictate, they have an attitude of gratitude and are always optimistic. Research shows that patients who are grateful recover faster than those who whine all day long. Whatever they do, they make it a point to over-deliver. Nowadays, people want to do just what is expected or less. I wrote an article about becoming the purple cow. Successful people are happy to do more and be like the purple cow. 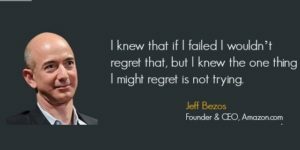 Successful people embrace failure. Failure is not an enemy because you learn how not to fail. They take risks and try different projects. They do what ordinary people are afraid of doing. Anyone can be successful. Lot’s of research has been done to see what separates successful people from ordinary folk. The truth is, they don’t have a unique gene. All they have are these ten points I’ve mentioned. Don’t forget to enter your email Now for monthly tips. You always inspire me. I will keep reading and doing more research to over deliver. Awesome. I love your spirit. That’s they way forward. I love your article. Got there a lesson to help me out. Josephine. I’m happy I was able to help. Thanks for visiting. You are welcome. Thanks Stanley for visiting. Wow!This is awesome and I love it.It’s an inspiration. Happy to be an inspiration. I love podcasts too. You are right, there is so much we can learn from reading & listening to other successful people. You’ve just nailed it. Those ten traits are a MUST if one is to succeed in whatever s/he endeavors to do. Thanks a bunch for the invaluable insights.